Lockheed Martin (NYSE: LMT) has secured a potential five-year, $7 billion indefinite-delivery/indefinite-quantity contract to help sustain the U.S. Air Force‘s fleet of F-22 air vehicles. The Defense Department said Thursday Lockheed’s aeronautics business unit will perform work at various locations within and outside the continental U.S. that include Air Force and joint bases in Alaska, California, Florida, Georgia, Hawaii, Nevada, Oklahoma, Texas, Utah and Virginia. 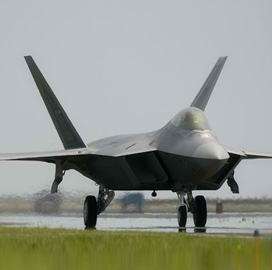 Sustainment work on the F-22 fleet will also take place at overseas facilities, support bases and other locations. The Air Force Life Cycle Management Center is the contracting activity and the service branch obligated $1.9 million in fiscal 2018 operations and maintenance funds at the time of award. The sole-source contract has a base ordering period of five years and work could extend through Dec. 31, 2027, if all options are exercised.